Time, said an unidentified wit, is what keeps everything from happening all at once. History is the temporal landscape of a world, what keeps it from being either an endless dreary plain or a chaotic jumble. Even mainstream fiction can't escape history, and sensibly doesn't try. Romance in the broad sense can escape it even less, because it is about big characters who need a big landscape to play in. I don't mean just the world-saving stuff: the Lensmen*, Hari Seldon, Frodo, or even the next level down, D'Artagnan saving the honor of the Queen of France. Even chicklit, which of the whole Romance spectrum probably veers closest to mainstream, takes place in the big city. It doesn't need a great deal of history, but other subgenres of Romance do, with fantasy and SF being the heaviest users. Moreover, for all the history they consume, only a small part of it is real; the rest has to be made up. Making up history is obviously easier in some respects. You won't need to google your fingers raw, then end up going to a university library to find out some obscure but crucial fact; if your hero needs a ferry to cross a particular river, you can make sure the bridge wasn't built till later. Even fake history has to sound convincing, though - more so, in fact, than real history, which can always fall back on being, well, true. The Byzantines got the the secret of Greek Fire in the nick of time to save Constantinople from the great Arab siege of AD 674, but do not try this trick at home. Once upon a time you could get away with it, but these days, if your space empire gets free-electron X-ray lasers just in time for its twenty old system-defense ships to zap 2000 Zorgon battlecruisers to oblivion, you had better be brilliant at tongue in cheek or you are toast. Tomorrow I'll look at a few popular tropes, and as why Edward Gibbon was the father of future history. * Confession that I've never read any Doc Smith. Since I named this blog the Rocketpunk Manifesto, perhaps it is order to offer a couple of snippets of rocketpunk. The two passages below are, so far as I know, the only ones specifically written as such. Originally posted at sfconsim-l, both are shameless imitations of Robert A. Heinlein - faking, I hope, the style of his YA classics from the 1950s, not his didactic and tedious later books. "Nothing at all?" asked John. Uncle Ray, he thought, would have plenty to say about idiots in government if he knew that the Federation's missiles did not have warheads. "Don't need it," said Sgt. Murray. "At ten miles per second, anything that hits you - a solid slug, a water balloon, your mom's best china - packs thirty times the punch of high explosives. Don't believe me? Check it." John took out his slipstick and checked it. He whistled. The year before he left for the Academy, a kid drag-racing on Main St. spun out at 120 mph: His convertable punched through a brick wall and ended up in the lobby of Midstate Bank. This was three hundred times faster. The empty casing of a Mark VII target-seeker rocket has a mass of 120 kilograms. At ten miles a second it will slam into its target with the whallop of an 8000-lb bomb. Whether it carries a load of TNT, a damp squib, or nothing at all, makes no difference. "It's some old coot down in New Zealand, Lieutenant," said the corporal. "Says he's an amateur astronomer. Something about lights in Virgo. Just thank him and log it in?" Lieutenant Nunez glanced at the system map, updated daily. "Umm, let me talk to him a moment." Well-meaning citizens were forever calling in to report airplane lights, the planet Venus, and radio masts on nearby mountains. Amateur astronomers, however, usually knew their way around the sky - sometimes better than the professionals did. Cpl. Shelby handed him the phone. "Hello? ... Yes, Mr. Murray ... Yes." Nunez started writing. "You say that right ascension is ... drifted approximately 5 arc minutes ... Thank you, Mr. Murray. You have a good evening too ... You have a very good evening, sir." Nunez studied the map, sketched an orbit, checked it with his slide rule. "Give me GHQ, Corporal." A voice came on the line, and he was passed up. "Yes, Commander. You may want to wake up General Gordon. It looks like we just found the Belter fleet." This passage, alas (? ), is obsolete. Finding a few spaceships millions of kilometers away might seem a hopeless task, but space is mostly dark, while spacecraft are pretty bright. Even if you paint them black they are still bright, in the infrared - if they aren't, the crews have frozen to death. Moreover, rocket engines powerful enough to drive spaceships are REALLY bright, bright enough to detect in a modest-size telescope from clear across the Solar System ... so long as you point it in the right direction. In Heinlein's day this last was enough to give space attackers a chance of eluding detection, because human lookouts get bored and lazy. Computers, however, do not. For this reason, the rule of thumb among those of us geeks who think about this stuff is that in space, Everyone Sees Everything. From another blog (now on my blogroll), the wonderfully named Paleo-Future, are some postcards of the year 2000, put out by a German chocolate-maker around 1900. Windsurfing seems more practical, if strenuous, than water-walking suspended from a balloon, but I like the marine unicycle in the first postcard, and the moving slidewalk in the second is quite elegant. Also worth a tour is the Future Past website. Yesterday a member of sfconsim-l posted a link to this article, predicting the technological wonders of the year 2000, apparently published in the December, 1900* issue of the Ladies' Home Journal. The author's 28 predictions (one is a repeat) are a combination of startling prescience - air forces and global real-time telecommunications, for example - interesting near misses (60-knot transatlantic ocean liners riding on combination hydrofoil/air-cushions; television that you have to go to a movie theater to watch), and sheer quaint oddities (Peas as large as beets!). Since I detest peas, I'm glad the last one didn't come true. As was the norm until our own dystopian age, The Future worked rather better in prospect than it proved to in the event. The trip from suburban home to office will require a few minutes only. A penny will pay the fare. Fleas and mosquitos - even the sneers-at-nuclear-radiation roach - would be exterminated. Indeed, so would nearly all wild animals, an outcome that seems dystopian to us, though apparently it wasn't to our great-grandparents. A fair proviso must be made that one member of sfconsim, its founder in fact, has questioned whether this article is a hoax. It's an interesting commentary on the limits of online research that no amoung of googling would provide a fully reliable answer; the only real test is to go to a brick-and-mortar library and look up the hardcopy issue. If it is a hoax, though, it is a very well-crafted one; it reeks of its purported era, right down to the archaism of hyphenating "warships" when speaking of aerial war-ships. My own guess is that it is real; the pattern of hits and misses is consistant with other prognostications that I have seen from this era, and the style is thoroughly period. On Edit: Its authenticity has been confirmed, and a link to a Google scan of the source text supplied, by kedamono in the comments below. I spoke too soon about the limits of online research! The (presumed) author, an eminent engineer of the time, did a great deal better than the futurists of midcentury did in predicting The Future that I thought I would be growing up in. I'm still waiting for my household robot, let alone my ticket to the Moon. The Future, in fact, was still a pretty novel concept in 1900. People in 1800 could have had scarcely any concept of it; though the Industrial Revolution had (in retrospect) already begun, it had not yet effected their lives enough for them to be aware of the potential for and effects of rapid technological change. Adam Smith, in The Wealth of Nations (published in 1776), has a great deal to say about improvements in technique, but only mentions the steam engine once, in a footnote. The Future is now largely passé; I don't recall seeing any articles about Life in 2100 in the past few years - no doubt there were a few, but none that caught my eye. Eager anticipation of hypersonic transports (LA to New Delhi in an hour!) has been replaced by glum realization that we'd just end up stuck in freeway traffic for hours getting to the airport, and lurking concern that both places will be largely underwater due to global warming. Thus the crisis of science fiction. The cool stuff, space colonies and the like, has largely given way to dystopias on the one hand, or transhumanism and the Singularity ("Rapture of the Nerds") on the other. Neither one, to put it plainly, is very much fun. Hence my offering of Rocketpunk as a way to breathe some retro-life into the genre. Without it, the current trend will probably continue, and our children will know everything about dragons and nothing about spaceships. Scarcely had the electrons dried on my last post about extrasolar planets than some pretty dramatic news hit the wires: discovery of the most Earthlike extrasolar planet yet, orbiting the star Gleise 581, about 20 light years away. The star is a dim red dwarf - though quite close as stars go you would need a telescope to see it - and it was already known to have two other planets. Earthlike is a relative term - I wouldn't recommend buying real estate there yet, even if we had a way to get there. The planet is at least eight times Earth's mass, thus probably about twice its size - possibly rather more, if it is largely made of less dense stuff than rock, as big planets usually are. All we know about it is its distance from the parent star, 0.073 AU* (about 10 million km), and its minimum mass - the mass may be greater, for reasons I'll go into if someone wants me to. * An AU, "astronomical unit," is the average distance from the Earth to the Sun - about 150 million kilometers, or 93 million miles for those of us in countries where they still use medieval units. Get used to it, because I will be using AUs a lot here. We also know how bright the star is - not very (about 1/200 as bright as the Sun) - from which we can determine how much sunlight, or Gleise 581-light, it gets. Even this little bit of information, however, is enough to take a fair first guess at the planet's temperature, which comes to about 0-40 degrees C (32-104 F) - a temperature that permits liquid water, the most basic stuff of life. It could be colder if it is covered with ice that reflects away most of the light that otherwise would warm it, or much hotter if it has a dense greenhouse atmosphere like Venus. Still, it is at the right distance to have liquid water, which is a very good start. Conceivably - pure speculation here - it could have a lot of liquid water, perhaps a hydrosphere several thousand kilometers deep, making Earth's oceans look like a thin muddy film by comparison. This discovery isn't just cool - it is awesome. I do not much care for beanstalks, for reasons that have nothing to do with the blood of an Englishman. For those of you who are not space geeks, I should briefly explain what a beanstalk is. A satellite in the right orbit, about 40,000 kilometers up, is "geostationary" - it orbits the Earth in 24 hours, and therefore seems to float at one spot in the sky. If you were aboard a space station in that orbit, and you had a long enough and strong enough wire, you could reel it out till the other end reached the ground. You could then use it as a rope ladder to go up and down with no need of a rocket or anything resembling a rocket. This is a beanstalk. It's quite a brilliant concept, really, and no great surprise that in the last few years it has become very popular both in science fiction and nonfiction space discussion. So what do I have against beanstalks? They do have a few technical hitches. No currently known material is strong enough for a wire hanging down from 40,000 km to support its own weight without snapping, let alone carry a load. (However, there are laboratory hints that such materials may be possible.) Reeling the wire down and anchoring it at the ground end could be ... challenging. Devils also tend to lurk in the secondary details, such as operating the elevator cars that would run up and down along the cable or cables. All of these may well be solvable; a beanstalk would still be a truly stupendous civil engineering project - essentially a railroad suspension bridge, 40,000 kilometers long, turned on-end. Given that an ordinary light-rail line costs at least $10 million/mile, a beanstalk to orbit would be perhaps a trillion-dollar investment. And that is my beef with beanstalks. At some future date, space traffic might be so heavy that the enormous investment could be justified - the Interstate Highway System probably did not cost all that much less in present-day dollars. 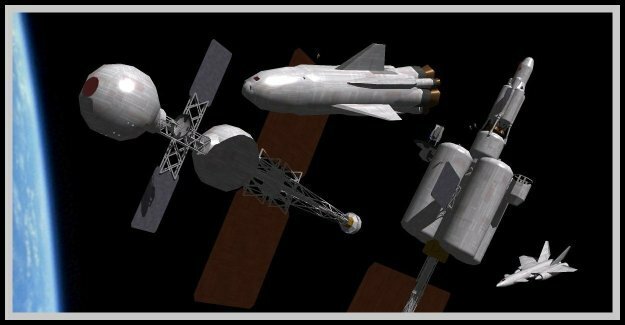 The fashionable trend in SF and space speculation, however, is to lo-ball the cost down to as little as $10 billion, and see beanstalks not as an eventual successor to shuttle-like reusable orbiters but as a near-future substitute for them. On one level this is understandable. The Shuttle has turned out to be a huge disappointment (for reasons I'll discuss in a future post), and the technical challenges in building a truly robust orbital transport are enormous. Yet to pin our hopes for space access instead on a technology never demonstrated on any scale, and perhaps not possible at all, strikes me as a bit like putting our faith in magic beans. * Or 50 to 100 parsecs. Astronomers never use light years, only parsecs, meaning parallax of one arc-second - the distance at which Earth's orbit would look roughly the size of a dime as seen from a mile away. To sound like a pro, use parsecs - but light years are much cooler. According to the Encyclopaedia, maintained by the Paris Observatory, 227 extrasolar planets are now known, plenty enough to make up for poor demoted Pluto. The California-Carnegie site, more conservatively, proclaims 202 "nearby" extrasolar planets - apart from the inevitable competition between research teams, there is always disagreement at the margins over both what is a planet and what counts as "nearby." However you count them, this is two dozen times as many planets as there are in the Solar System, with or without Pluto. For such a profound discovery, the extrasolar planets don't get very much public attention, and it is easy to guess why: There are no dramatic pictures of them, in fact no pictures at all. All have been detected by more or less indirect means, and we have no idea what any of them look like (though there are some gorgeous if speculative images by space artist Lynette Cook). For both astronomers and science fiction writers, the extrasolar planets have in fact been just a bit awkward. Most are giant planets, roughly as massive as Jupiter, but orbiting very much closer to their parent stars - half of them closer than Earth is to the Sun, and about a third of them closer than Mercury. No one expected this; when they started turning up the theorists had to scramble to explain them. For astronomers and SF writers alike it has meant that planetary systems are not the way we expected them to be. In fairness, much of this embarrassment may be due to "selection effect." Our methods of finding them work best, and confirmation comes most quickly, for big planets close to a star. Thus those 200-odd planets are typical only of the kinds of planets that are easiest to find. If twins of Jupiter orbit nearby stars, they would be barely at the uncertain threshold of detectability - and even once initially detected it would take a decade or so to confirm that they are the real deal. Yet here's a lurking uncertainty: Perhaps the Solar System is not typical, but something of a fluke, in which case Earthlike worlds may be few and far between. It's also a bit humbling that Ma Nature threw us such an unexpected curve. All the same, it is awesome to think that there are over 200 known worlds out there, harbingers of countless more waiting to be found. So ... here we go, with roughly the one-billionth blog on the Web. Is it really needed? On the other hand, is any justification really needed? So here it is. Steampunk is science fiction, but it is science fiction set in a past era, specifically the victorian era. Do were consider 1950s science fiction "rocketpunk?" Of course not, but if someone were to set a story in that era and write it as though it was a 1950s science fiction novel, then it would be considered "rocketpunk." Steampunk is now a familiar SF subgenre, set in a retro-futuristic vision broadly inspired by Verne and Wells. Among other things it requires a special kind of magitech, really magi-science, with things like aether ships. Surely there is now a place for a retro-future based on the vision of 50 years ago, on the verge of the actual historical space age. I will call this rocketpunk. Monorails were always a silly idea (good old standard gauge railroad tracks work just fine), but the Moon trips would have been seriously cool. Instead, here we are in 2007, and the new Official Space Vision is warmed-over Apollo capsules. The old Heinlein and Clarke stories had the space technology pretty much right; what they horribly underestimated was the cost. You actually can go into space as a tourist now - all you have to do is wave $20 million in front of the Russians, and up you go. That, more or less, is what Rocketpunk is about. This being a blog, however, I have no intention of confining myself only (or even mainly) to rocketpunk as such - but it is a handy center of gravity for a scope of discussion that includes science fiction in general, fantasy, historical fiction - including imaginary history - and actual history. All of which are either part of or provide source materials for a genre that fills half the bookstores but has no common name. I'll get to that in a future post. Meanwhile, welcome to Rocketpunk Manifesto! This is a test. This is only a test. In the event of an actual blog entry, you would be advised to turn to 640 or 1240 on your AM dial for news and official information.